Advocates of interventionism characterize capitalism as the freedom to exploit — that is, as freedom to pay sweatshop wages, freedom to amass unequal wealth, freedom to degrade the environment to enable production, and freedom to discriminate. While a free market does sometimes allow individuals the freedom to act in ways progressives may not like, the overall effect of economic freedom is to promote many of the values its opponents claim to champion. Market competition penalizes exploitation and rewards those who contribute to the general welfare. Skeptics may scoff, but the empirical data support our claims. The Fraser Institute releases reports on its Economic Freedom of the World (EFW) index annually. The simplified criterion for economic freedom is determined by the size of government (which encompasses spending and taxes), security of property rights, access to sound money, freedom for international trade, and regulation of credit, labor, and business, though there are actually 42 different data points used as measurement, all of which fit into the five categories listed. In other words, the more capitalist the economy, the more it’s considered economically free in Fraser’s index. Do countries with more economic freedom truly pay poor wages, abuse their environment, and suffer from other flaws critics contend that they do? Listed below are five reasons to support economic freedom. To start with the blatantly obvious, economic freedom is good for the economy. As the chart below shows, in the 20-year period between 1990 and 2010, the most economically free nations grew at rates more than double those of the least free nations. Even a tiny level of growth compounds heavily over time. An economy that grows half a percent faster than it would have otherwise grown over a 100-year period will experience 400 percent more growth overall than without that extra half a percentage point. The difference between 4 percent and 3 percent annual growth determines whether it will take an economy 18 years to double in size or 24 years (simply divide 72 by average annual growth to determine how long it will take for an economy to double in size). Critics argue that due to rising inequality, those at the top have captured all the benefits of economic growth. According to this argument, less economically free nations may have slower growth, but the increase in wealth is more evenly distributed among the population. I refute this argument in the next section. Economic growth translates to higher incomes not for just the wealthy, but for everyone. To quote from Fraser’s findings, in purchasing power parity adjusted 2011 dollars, per capita income in the freest nations was $39,899, compared to $6,253 in the least free nations. These numbers are just averages, so technically they may be overstated if an income distribution is right-skewed. But the poor are richer in more economically free nations than in the least economically free nations by a multiple of eight, with a per capita income of $11,610 compared to $1,358. Fraser researchers even note that the average income of the poorest 10 percent of the population in the freest nations is nearly double the average income in the least free nations. So whatever one thinks about inequality, purchasing power is stronger in economically freer nations. And greater purchasing power for the poor means a higher standard of living. 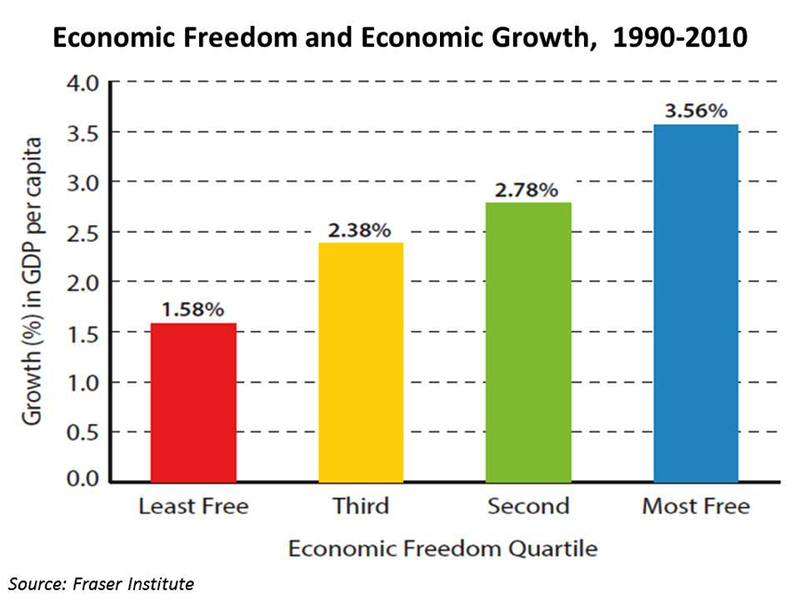 Economic freedom not only helps the economy grow faster overall, but it also makes growth less volatile. There are only three studies on the subject that I am aware of (published by Noel Campbell and Thomas Snyder in 2012, Jody W. Lipford in 2007, and John W. Dawson in 2010), but all yield the same results: a negative correlation between economic freedom and volatility in the business cycle. Campbell and Snyder do find that there are diminishing returns to the positive effects economic freedom yields for the business cycle, but there is no doubt that the effects are positive. The boon that economic freedom provides translates to employment stability. Research published at the St. Louis Federal Reserve found that, domestically, the freest economies (using the Fraser Institute’s index) experienced faster employment growth. To give some exact figures, the paper found that a one-unit increase in economic freedom (Fraser uses a scale of 1–10, with one being the least free and 10 being the most free) resulted in increased employment growth of 3.8 percentage points from 1980 to 1990, 4.5 percentage points from 1990 to 2000, and 1.4 percentage points from 2000 to 2005. These results are found after adjusting for other differences that would affect employment growth, such as the percent of population with a college degree, countries with a larger percentage of the population employed in declining industries (e.g., manufacturing), and population density. The authors argue that economic freedom stimulates employment growth in two ways: by encouraging entrepreneurial activity and by reducing costs for existing businesses. A substantial body of evidence supporting these hypotheses has accumulated in recent years. For example, using country averages from 45 industrial and developing countries, Feldmann (2007) finds that a higher level of economic freedom in 1980/1985 is correlated with a decline in both the unemployment and the youth unemployment rate over the period to 2000–2003. Furthermore, he finds an increase in economic freedom from 1980/1985 to 2000–2003 to be associated with a fall in the youth unemployment rate over the same period. Additionally, using panel data from 81 industrial and developing countries he finds that a higher level of economic freedom is correlated with a lower youth unemployment rate. Before we dive into the evidence, it’s worth exploring why we should expect economic freedom to help the environment. The most basic explanation is that private ownership incentivizes the conservation of resources. When everyone owns a resource in common, the incentive to conserve is removed. This is called the tragedy of the commons. While someone may conserve a resource on their own private property because they know it will be worth more in the future, the incentive to conserve disappears when the possibility that someone else can take the resource becomes part of the equation. Access to clean water, sanitation measures, life expectancy, and deforestation all are more favorable in nations with stronger private property rights. When property rights were well protected, for example, about 90 percent of the population had access to safe water; but in nations with weak property rights, only about 60 percent of the people had that key health advantage. The Fraser Institute finds that more economically free nations have higher levels of air quality, and the Heritage Foundation finds that nations with the greatest protection of property rights have the most favorable scores on Yale University’s Environmental Performance Index. In her honors dissertation at Florida State University, Signè Thomas examines a potential social benefit of economic freedom: it improves the socioeconomic status of women. Thomas compares three different metrics of socioeconomic status against the economic freedom indices in those countries. These metrics include the Gender Empowerment Measurement (GEM), Gender Inequality (GI) Index, and Gender Equality Rating (GER). The GEM is based on the number of seats held in parliament by women; the number of female legislators, senior officials, and managers; the number of female professional and technical workers; and the ratio of female to male income. The GI index measure looks at the maternal mortality ratio, adolescent fertility rate, female parliamentary representation, educational attainment, and female labor force participation rates. The GER looks at the degree to which a country enforces laws and policies that promote equal access for men and women in education, health, economic participation, and legal protection. After controlling for religion, political rights, ethnic diversity, natural resources, and GDP, the results are clear: more economic freedom leads to a nation performing more favorably on the metrics discussed. 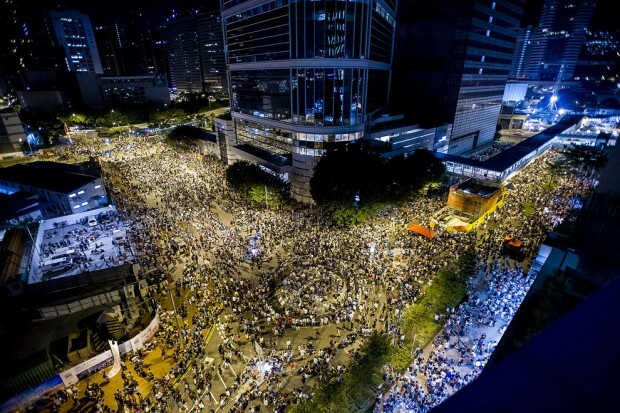 The evidence refutes the critics of capitalism. The market system benefits not only the rich but the poor and middle classes as well by raising incomes for everyone and stabilizing economies. The benefits of free enterprise stretch far beyond mere monetary benefits, as capitalistic countries have cared better for their environments and helped elevate the social status of women more than any piece of legislation could hope to.